The Fernando de Noronha Archipelago is a Marine National Park located 200 miles off the northeastern coast of Brazil. Noronha is a mountainous archipelago of volcanic origin that was wonderfully shaped into one large island and 20 smaller ones. Their beautiful sandy beaches and crystal-clear water host the most diverse marine life in Brazil. The archipelago is a world-class dive destination and a heavenly retreat for underwater pleasures. Due to its open ocean location, which provides pelagic fish and ocean mammals a refuge and the strict protections placed on this national park by the Brazilian environmental protection agency, we can guarantee the fish will be there when you are. The dive sites include a wreck dive, caverns, amazing coral and volcanic rock formations, an array of reef sharks, rare green and comb turtles of up to 660 pounds, schooling barracuda, all kinds of rays and schooling reef fishes of every kind and color, and wild dolphins. Did we say dolphins? Lots of dolphins? That's right! You will have the chance to marvel at the sight of over 600 spinner dolphins at one time. Noronha serves as the breeding ground, play ground and home to the oldest and largest residential school of dolphins on earth. For this and other reasons, the island is one of two in Brazil to have been designated a world heritage site by UNESCO (United Nations Educational, Scientific, and Cultural Organization). The best spot to see the dolphins socialize and spin up in the air is from an outlook ashore, especially since swimming with them has been prohibited-of course, that is not to say you will not bump into them during your dives. While hiking the trails around the shore or up the forested mountain, you will also see that the archipelago provides habitat for several unique species of migratory and island birds. On top of it all, Fernando de Noronha visitors will be in the home to the only mangrove as well as the only known existence of Atlantic Rainforest in the Atlantic Ocean. Finally, the archipelago has a long and still noticeable cosmopolitan heritage going back to the occupation by the Dutch in the 17th century and the French in the 18th century, and passing by the distinguished visit of Charles Darwin and his research expedition in the 19th century as well as the presence of military Americans while Noronha served as a base for airplanes in the 20th century. The history of the 21st century is showing international visitors dive so much in the archipelago's hospitable human and natural environment as to call it their homes. - Below you will find a list of the best dive spots in Noronha. Swim with the juvenile sharks at Laje Dois Irmãos. Due to the location of Noronha between Brazil and Africa and the currents that move through the Atlantic, Noronha is a breeding/nursery area for 14 species of reef sharks. The sharks come into this protected area to have their babies and the babies stay until they are big enough to venture into the open ocean. As you wait on the sandy bottom 79 feet under, out of the distance, about 20 to 30 will appear and swim around you. Most of them are juveniles and are simply curios kids coming in to see who is visiting. For the advanced diver, the wreck of the Ipiranga, a Brazilian Navy corvette (small destroyer) that went under in 1987, will surprise you. This is one of the most pristine wreck dives you will find anywhere in the world. 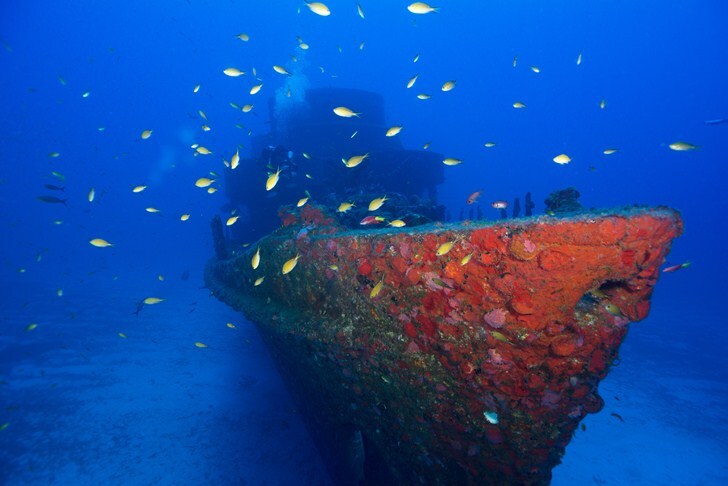 The 150 ft. ship is sitting upright on the bottom at 207 feet below, totally intact, swarming with fish and covered in beautiful encrusting corals. The uniforms still hang in the closets! A wonderful dive site with excellent visibility and full of arches, canyons, small caves and big fish on top of a rocky bottom covered with life at 56 feet below. Here you will have a very good chance of seeing turtles, sharks and stingrays. Considered one of the best dive sites in Noronha. 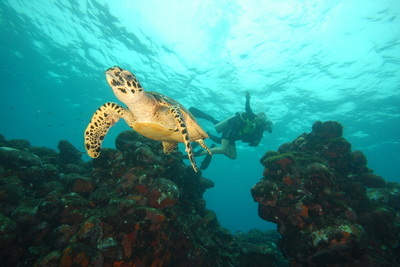 Here you will find fascinating submerged corridors full of colourful sponges, large pelagic fish, turtles and sharks. The ocean bottom is at 79 feet under water here. A big cave that is easy to get into and wide enough to look like a ballroom. The area is surrounded by a rocky coast and by lots of sponges and fish. The ocean bottom reaches 92 feet below water at this dive. Submerged tower that almost rises above the ocean surface and with which the Ipiranga corvette collided causing it to sink. At the bottom under 138 feet of water, you will find sting rays and other fishes in passing. There are daily flights to Noronha from Natal and Recife offered by the airlines Azul and Gol. Visitors to Noronha often stay in Pousadas, which are small family owned accommodations, where you will experience the life style and warmth of the people. Comfortable sleeping arrangements and warm water showers are the norm. There are a couple of hotels for more luxury, however there are no 5 star accomodations in this national park.